The Tucson Parks Foundation is pleased to announce the addition of the following community leaders to its board. They include Teresa Bravo, Pima County Economic Development and International Projects Coordinator; Dan Chambers, who is retired and a community philanthropist; Sara Kaufman, Southern Arizona Adult Tennis League Coordinator and Annemarie Medina, YMCA of Southern Arizona Vice President of Corporate and Community Partnerships. • Social Media Posts on Facebook and Twitter, mention in all PSAs. 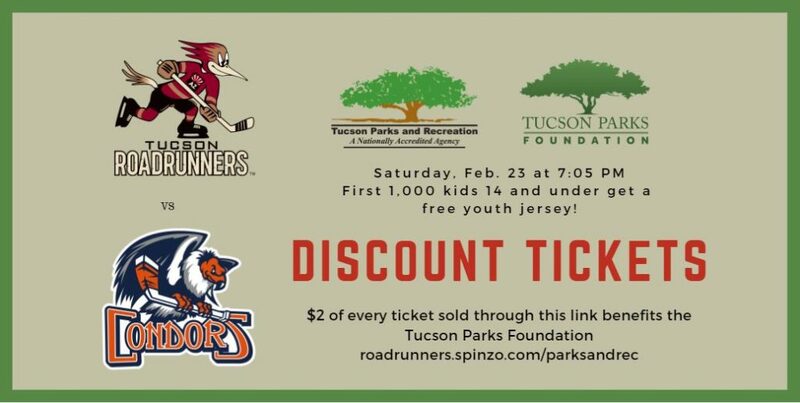 Tucson Parks and Recreation and the Tucson Roadrunners are hosting a special parks and recreation night at the hockey game on Saturday, Feb. 23, at 7:05 pm, as they take on the Bakersfield Condors. Discounted tickets can be purchased online, with $2 of every ticket sold going to the Tucson Parks Foundation. Don’t forget, it’s also Roadrunner youth jersey giveaway night with a free youth jersey going to the FIRST 1,000 kids 14 and under through the door. Don’t forget to sign up now to get your place in the Don Pooley Pro-Am! In 2011, we started working towards the development of a park to honor those who forever remain in our hearts and memories. One such person was my son who lost his battle with mental illness in the summer of 2009. I vowed to care for his most precious things … his family, friends and neighbors. They all have urged me to turn the spot of his death into a place of comfort and recreation for our entire community to enjoy. We invite any who have lost someone they hold dear to join our project. Shared by Valerie Chandler, lead organizer for the Silvercroft Unity Park Project. To donate, please visit our Donations page and choose Silvercroft Unity Park Project from the “Donation Type” dropdown menu. Swings are about the only thing Stephanie Balasz’s young children can play on safely at Udall Park‘s playground. The 28-year old play area is outdated and missing pieces, making it pretty hard for a child under 4 years old to access without assistance, she says. “It’s a super utilized park and the playground is just kind of, ‘wah wah,'” she added. The playground won’t be in disrepair much longer, though, thanks to some determined parents and a grant from Kaboom, a non-profit that builds parks in one day. After being told by the city that a new playground for Udall, 7290 E. Tanque Verde Road, was not in the budget, Sierra Boyer, community promotions and marketing manager for Tucson Parks and Recreation, connected Balasz with non-profit Kaboom to get the ball rolling at the park. With the grant, community children and parents get to help design the playground. “It really gives the community a sense of ownership in the playground and equipment,” Boyer said. About 30 children and their parents gathered in a meeting room at Udall Park Thursday to participate in Design Day, during which the kids got to draw their dream playground. Those drawings are then used as inspiration for the final product, said Derrick Dixon, associate project manager for Kaboom. Seven-year-old Milo Smith worked diligently at his drawing, his imagination hard at work. Milo’s sister, Tarryn, 9, came prepared. She printed out a picture of a playground she found online and wrote a list during the drawing exercise. She wants the playground to include benches around the outside, shade, swings and pull-up bars you can spin on, all in rainbow colors. At the end of the drawing exercise, Ellery Deruyter, 12, showed his dream playground to the group. It included a zip line, tree climb and laser tag. Brian Sabelka, a parent working on the project, is excited about the prospect of a new playground for his two young children. He and Balasz have gone to various playgrounds to get ideas. Other parents have ideas too. Jessica Diaz, mother of one, said they are at Udall Park at least once a week for soccer and baseball. She agrees that the playground is not accessible for children in the 2-4 age group. She would also like to see equipment that is accessible for children with special needs. Diaz’s son, Matai, 7, wants to see new monkey bars and a rock wall. The idea of asking the community what they want is beautiful, said Judy Lipham. But there’s still work to be done to make the new playground happen. Balasz and her planning committee which includes parents and community members, must raise at least $8,500 to match the grant. They are currently seeking donations from businesses and people in the community. The group also has to recruit at least 100 volunteers for build day which will take place May 23 — and provide food and drinks for those volunteers. 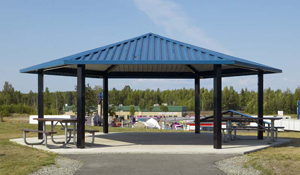 In addition, the planning committee wants to raise about $35,000 to build a shade structure over the new playground. Those interested in donating funds for the new playground and shade structure can do so here. If you’d like to volunteer to build on May 23 or to help with two prep days, click here.